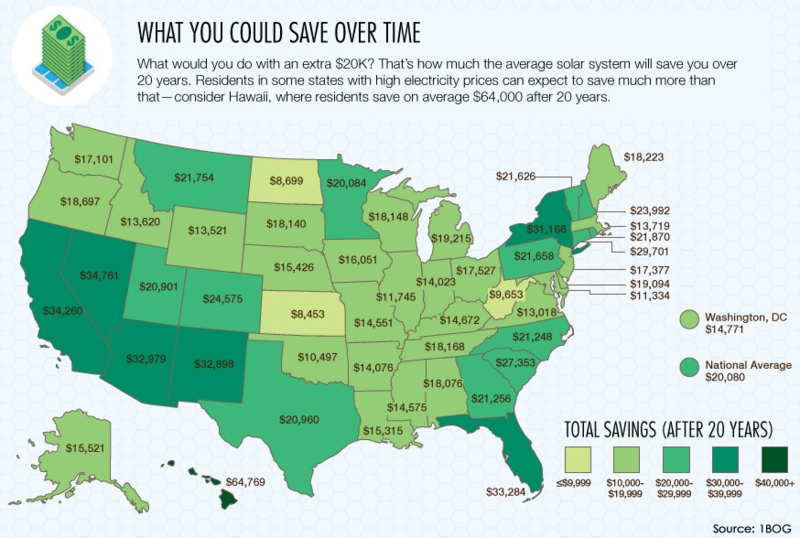 Research has proven: Solar Power saves you money. It's important to educate yourself before investing in the Planet and your Children by Installing Solar Panels on your home or business.. Here, we will tackle some of the more financial questions to determine if Solar Energy is right for you. 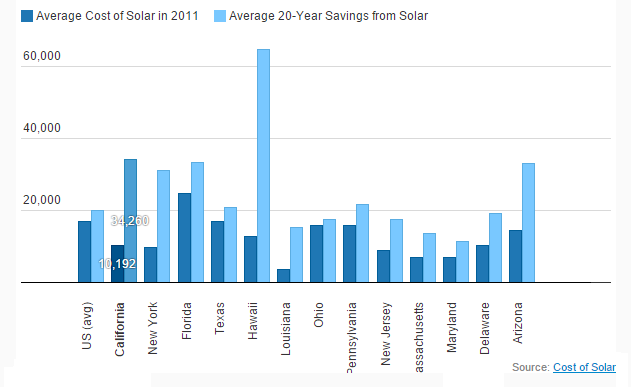 Electricity Bill savings could be the largest advantage of Solar Energy. Regardless of the size of your installation, you begin receiving lower monthly bills from your utility company. You have the ability to install as many Solar Panels as your would like at any given time. You can start with a small amount and add to later. 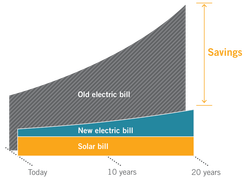 For each new kilowatt of solar capacity installed, you receive bigger utility bill savings. If your Solar Panel Installation is large enough, it is possible to reduce your electric bill to $0/month. But regardless of the size of installation, you can look forward to the savings growing as time continues. Utility Rates will continue to increase as we deplete our fossil fuels - but Clean and Renewable Energy from the Sun will always be FREE. Solar Energy is an investment that continues to create large payouts with each year. Did you notice California in the map above? Absolutely tremendous savings. The national average (in 2011) was about $20,000 in savings. This number was gathered years ago when panels were much more expensive. So how much could you save installing Solar Panels on your home or business? Give us a call and we can give you an Estimate, not simply of installation costs, but how your savings will pay that cost back in no time at all. Saving money and saving the Planet. Installation Size. How many panels will you have installed on your property? Property Location. Are you in an accessible area? Solar Incentives. What all incentive programs do you qualify for? Many customers have paid $0 upfront and received substantially lower electric bills. In many other cases, customers have spent upwards of $20,000 and generated tens of thousands of dollars in income from the solar installation. In the chart seen below, courtesy of "Cost of Solar," you can see the average Solar Installation package Costs along with an estimated 20-year electricity savings. The numbers come from a study completed in 2011. Keep in mind that the cost of Soar has come down dramatically since then, so the average savings in Santa Clarita, California is even greater than what the graph portrays. How Do I Generate Income With Solar Energy? Solar Panels will not only help you save of your Electricity Bill, but they can also generate passive income. California offers abundant Renewable Energy Incentives which are designed to encourage residents and businesses to "go green,' whether it's via wind power, water power or the adoption of Photovoltaic Panels. If you qualify for any of these incentives, your local utility company literally pays you for the clean energy your panels create. This energy is feeding back into their grid, providing them with the energy to use. So not only is your electricity bill $0, it's in the negative! If you're curious if you qualify for any of these incentives, get your FREE Consultation today. It doesn't cost you a thing to explore your options with Santa Clarita Solar Installation.